A healthy diet won't cure or prevent bursitis or tendinitis, but it can help manage your symptoms. Because both conditions involve inflammation -- inflamed bursa when you have bursitis and inflamed tendons with tendinitis -- avoiding inflammatory foods and emphasizing healthy alternatives can help minimize derivative pain and swelling. Before making significant dietary changes, seek guidance from your physician. Nutritional efforts shouldn't replace doctor-prescribed treatment. High-fat meats and dairy products are valuable sources of nutrients, such as protein. They're also leading providers of saturated fat, however, which increases bodily inflammation, making way for bursitis and tendinitis pain. The American Heart Association recommends limiting saturated fat to no more than 6 percent of your total daily calories, or up to 13 grams within a 2,000-calorie diet. To cut back on saturated fat, replace fatty meats, such as lamb, steak and skin-on poultry with leaner options, such as skinless chicken breasts, beans and fish. The omega-3 fats in oily fish seem to gradually lower inflammatory chemicals your body makes. 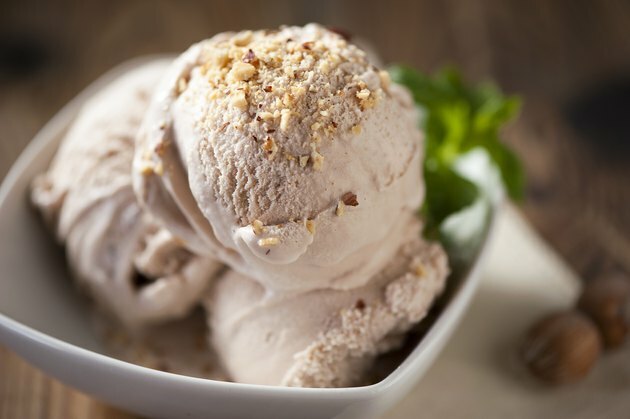 For less saturated fat from dairy products, choose low-fat milk and yogurt over whole milk and ice cream. Research published in "Nutrition" in October 2008 showed a significant link between a high-fiber diet and lower inflammatory responses in women. Eating too many refined grains leaves little room in your diet for whole grains, which provide rich amounts of fiber and other vital nutrients. Most Americans only consume about 15 grams of fiber per day, which falls well below the daily recommended 20 to 35 grams. Because refined grains have a high glycemic index, or impact on your blood sugar, they can also trigger inflammation. To benefit from fiber and cut back on refined grains, swap out white bread, pretzels and low-fiber cereals in your diet with whole grains, such as quinoa, popcorn and oatmeal. Overfeeding your sweet tooth can worsen bursitis and tendinitis pain similarly to refined grains -- due to their high glycemic index. The University of Maryland Medical Center recommends avoiding foods high in sugar and upping your intake of vitamin C and flavonoids -- both of which are prevalent in fruits and vegetables -- for improved bursitis symptoms. Replace sugary items, such as candy, soft drinks and frosted baked goods, with fresh fruit, fruit smoothies and baked sweet potatoes. Add pineapple to your smoothies for bromelain, a chemical that reduces inflammation. Partially hydrogenated oils is another term for trans fats -- unhealthy, inflammatory fats found in many processed foods. In addition to increasing pain and swelling associated with tendinitis and bursitis, they can seriously damage cardiovascular health. Trans fats should account for less than 1 percent of your daily calories, says the American Heart Association, which is equal to less than 20 calories or 2 grams per day. Avoid foods that list partially hydrogenated oils as ingredients. Common sources include stick margarine, shortening and commercially made pizza dough, pastries, pie crust, cookies and crackers. Eat healthy fat sources instead, such as olive oil, nuts and seeds.